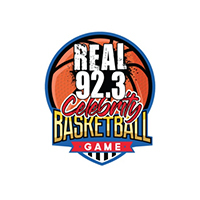 Los Angeles radio station, REAL 92.3, took over the Celebrity Basketball game to tip-off the Nike Basketball 3on3 Tournament in 2017. The game featured a wide range of entertainers from REAL 92.3 talent, to artists like Tyga & The Game, to ballers like Glenn "Big Baby" Davis to TV personalities like Nick Cannon. There was certainly no shortage of star power or skills come game time. The successful first-year event supported and benefitted the Follow The Dream Foundation. The 2017 Nike Basketball 3on3 Tournament was bigger and better than ever, with record setting participants and spectators taking part of the action-packed weekend. 3 Point spearheaded Center Court programming for the sixth consecutive year working alongside event emcee, Scotty B. The fan experience was highlighted by the Nike Dunk Contest, Skills Challenge, 3-Point Contest, Elite play, Special Performances and Pay-to-Play contests. The ESPNLA 710 Celebrity Basketball Game continued to enhance the overall experience at Nike Basketball 3on3 by giving the appropriate tip-off party. Featuring a matchup of ESPN talent like Marcellus Wiley, Ramona Shelburne and Michelle Beadle mixed with celebrities like O'she Jackson Jr, Jerry Ferrara and Josh Duhamel, there was no shortage in star power or hoop skills. All money raised at the event once again benefitted the Jimmy V Foundation in support of Stuart Scott. 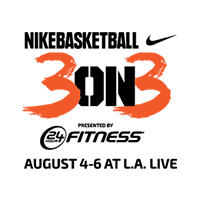 The 8th annual Nike Basketball 3on3 Tournament at L.A. LIVE drew the largest attendance to date, with over 100 basketball courts spreading throughout the L.A. LIVE campus and surrounding area in downtown Los Angeles. We partner with one of our favorite emcees to work with, Scotty B, to produce Center Court programming throughout the weekend. The event is highlighted by the Nike Dunk Contest which annually features the top street ball dunkers from across the country. The Nike Basketball 3on3 Tournament partnered with their neighbors at ESPNLA 710 to take the annual Celebrity Basketball Game to an even larger audience. 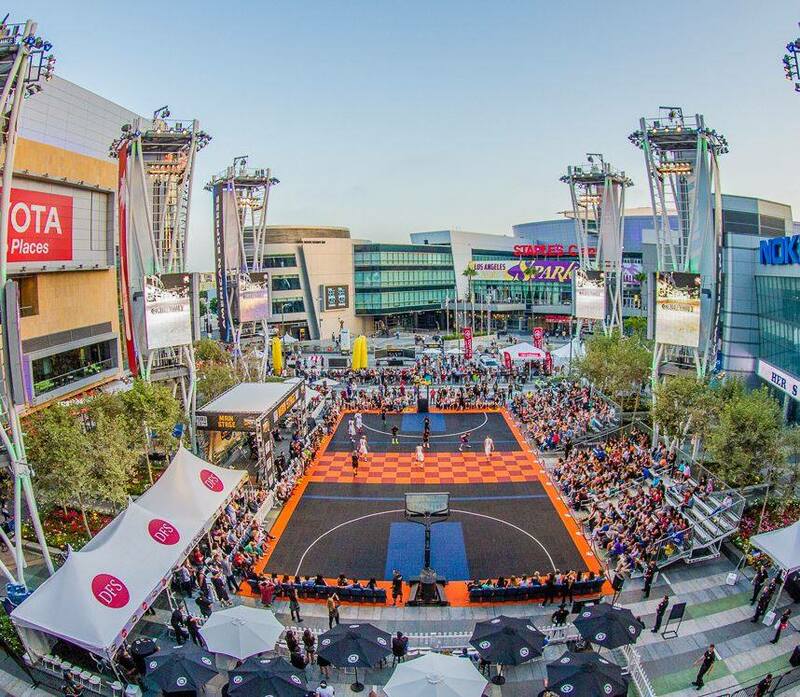 The station broadcasted an on-air pregame show from Center Court and for the first time, the game featured the L.A. LIVE plaza's giant video board carrying the action live for the in-venue crowd. Halftime featured a video tribute to ESPN's Stuart Scott, followed by a check presentation benefitting the Jimmy V Foundation. 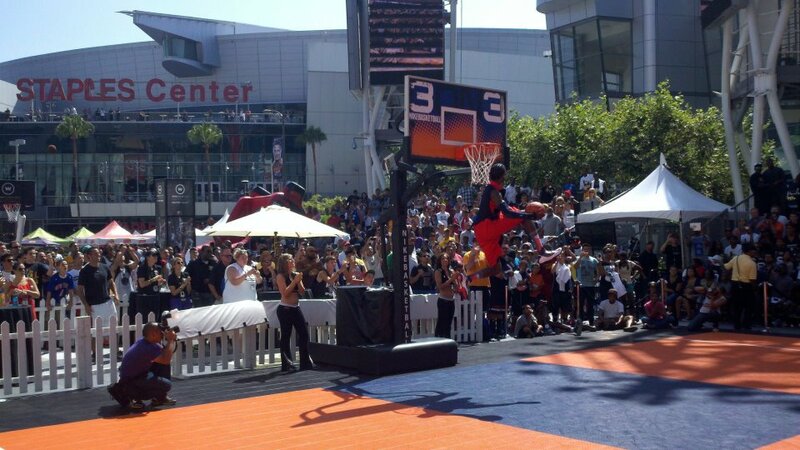 The 7th annual Nike Basketball 3on3 at L.A. LIVE provided entertainment for fans of all ages. Along with all of the contests, games and performances throughout the weekend, a highlight is always the Sunday afternoon Championship games. With formal team intros and themed music, we're able to provide the appropriately atmosphere for playing basketball in the shadows of the Staples Center. 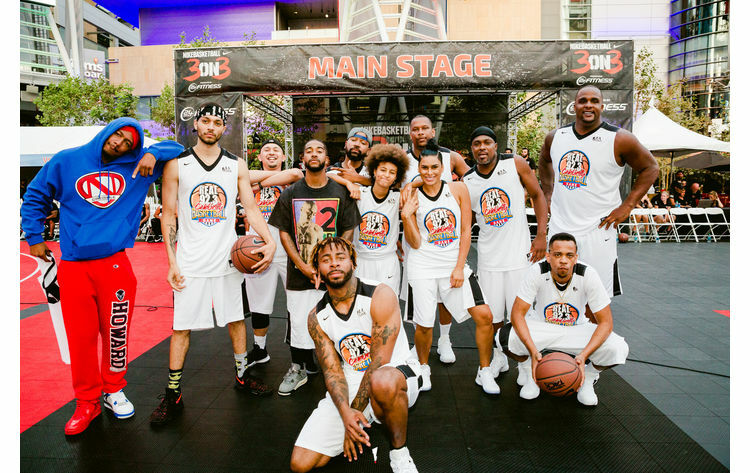 For three years, the Nike 3on3 Tournament at L.A. LIVE tipped off with the Josh Hutcherson Celebrity Basketball Game benefitting the Straight But Not Narrow Foundation. Josh, star of the Hunger Games, gathered a cast of celebrities which have included Terrell Owens, Lil Romeo, Joel David Moore, Christopeher Mintz-Plasse and many more of Hollywood's brightest stars for an entertaining evening of basketball for a good cause. The 6th annual Nike Basketball 3on3 Tournament once again featured a wide variety of basketball contests, performances and Elite Play competition to provide a weekend full of excitement. The 3-Point Contest and Skills Challenge are two features that have become traditions for the tournament, with registration always quick to fill up with those titles along with prizes from the Lakers, Clippers, Staples Center & Nokia Theater on the line. The 2013 Josh Hutcherson Celebrity Basketball Game featured a halftime ceremony in which NBA star, Jason Collins, was honored as the recipient of the Advocate of the Year Award presented by Josh's Straight But Not Narrow Foundation. Jason gave an impactful speech that represented the goals of Straight But Not Narrow and showed how an event like this can reach well beyond entertainment and positively impact lives. Center Court programming at the 5th annual Nike Basketball 3on3 Tournament saw a great addition with pay-to-play contests incorporated. In a variety of contests that included Knockout, Free-Throw contests and Halfcourt Shootouts, fans were able to showcase their skills and win big prizes from L.A. LIVE partners like the LA Lakers, Kings, Staples Center & JW Marriott. This element has gone on to become a staple of our Nike 3on3 Tournament production. The inaugural Josh Hutcherson Celebrity Basketball Game benefitting the Straight But Not Narrow Foundation was created in 2012. Taking place on Friday night of Nike Basketball 3on3 weekend, the stars of Hollywood converged on L.A. LIVE to create a signature event to tip-off Los Angeles's biggest weekend of basketball. 3 Point annually produces the game presentation as part of our scope at Nike Basketball 3on3. 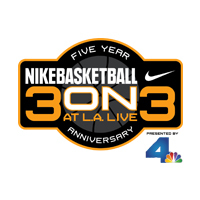 3 Point made it's debut at Nike Basketball 3on3 at L.A. LIVE in 2012, but our crew was very familiar with the event, having produced Center Court programming since the tournament's inception in 2009. It has grown to become one of the signature events on an annual basis for Southern California hoop heads. 2012 was highlighted by Justin "Just Fly" Darlington delivering one of the standout dunk contest performances we've seen in our entire history with the event.